From healing simple infections to soothing the nerves and improving cognitive function, nature holds many wonders that provide huge benefits for the body’s overall wellness. All you need to do is to know which is for what. 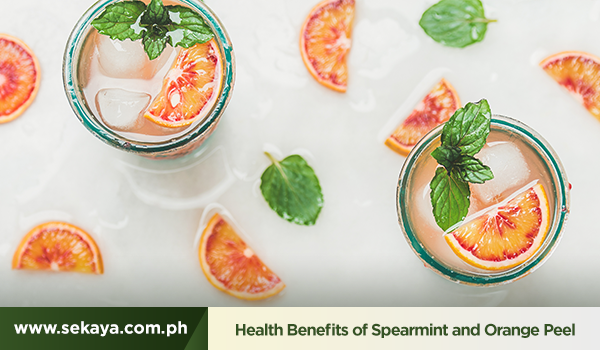 In this read, let’s look into two of nature’s best herbs for calming both mind and body: Spearmint and Orange Peel. Spearmint may sound familiar as it is a pleasant-smelling type of mint that’s often used as flavor for your favorite chewing gum, toothpaste and mouthwash. But there’s more to this mint than just flavoring for healthy food and cosmetic products. Yes, spearmint leaves you with fresh breath, but that’s not only the reason why the herb is infused into toothpastes and mouthwashes. Menthol, which is the active ingredient in Spearmint has natural antibacterial and antimicrobial features. This helps protect the mouth, teeth, gums and throat from infections. Spearmint tea, or even just a whiff of it, helps clear out blockages in the respiratory system, such as tightness in the chest, sore throats, congestions and the like. In line with its natural anti-inflammatory benefits, spearmint helps calm your stomach when you experience irritable bowel syndrome (IBS) and other digestive issues such as bloating, constipation, cramps, nausea and vomiting. Menthol carries sedative and antidepressant properties. That’s why spearmint and others in the mint family have a natural calming effect on the mind and body. Orange Peel: Don’t Throw it Away Just Yet! Hesperidin and Potassium in orange peels work together to lower blood cholesterol, regulate blood pressure levels and maintain good heart contractions. Orange peels are rich in dietary fiber and Pectin, compounds that are helpful in burning fat and managing appetite. Fiber in orange peel also helps keep digestive processes in check and treat disorders or issues such as constipation. Flavonoids and compounds such as Limonene lower the risk of cancer by inhibiting the formation of a protein (RLIP76) that’s linked to cancer. Brew a cup of Sekaya’s Happy Days or Floral Garden, and feel the natural healing effects of these botanicals for yourself!